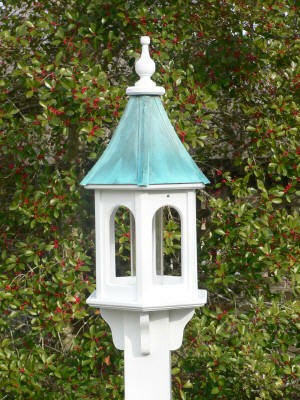 Patina Copper Roof Classic White Vinyl PVC Birdfeeder PC 10"
Patina Copper Roof Classic White Vinyl Birdfeeder PC 10 in. Patina Copper Roof Classic PVC Birdfeeder PC 10"
This is the classic gazebo style bird feeder design you have been looking for and the best part is that it won't rot or split. This classic design bird feeder will last for many years and the price is right. And it's also MADE IN THE GOOD OLE USA, AND FREE SHIPPING included.